Oral history interviews - Student interviewers have worked with ANU oral historian Mary Hutchison and sound designer, Kimmo Vennonen to conduct oral history interviews following the 2016 Speech Day awards and recent 2017 Canberra and Region Heritage Festival when our heritage-listed school building was open for the day. More information about this project is provided in the documents below. You can also contact Deputy Principal Catherine Dillon (6142 3060; catherine.dillon@ed.act.edu.au) or oral historian Dr Mary Hutchison (0402 815 08; mary.hutchison@anu.edu.au). Lady Lois Hicks enrolled in Ainslie School on her 5th birthday in 1934. Lady Hicks trained as a nurse at the Canberra Community Hospital and worked there until her marriage to (later Sir) Edwin Hicks, a widower with five young children, with whom she had a son and a daughter. Lady Hicks maintains a strong interest in Ainslie School and contributes quality information about its history. Ian was Dux in 1937 and went on to study at Canberra High School. He served with the 2/31st Battalion (Infantry) in New Guinea. He was wounded and was being flown home when the plane disappeared and he was presumed dead on 18 September 1945, just a few months shy of his 20th birthday. The remains of the plane and its occupants were not discovered until the early 1970s. Alan attended Ainslie School in the 1930s. He made significant contributions to the Ainslie Football Club and the Ainslie Football and Social Club as a player, an official and an office bearer for most of his life. 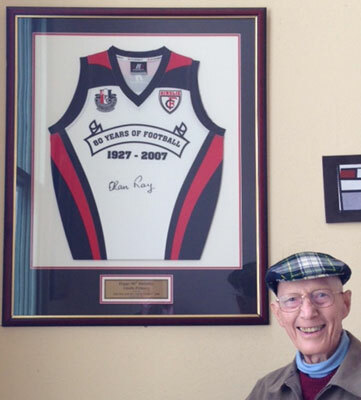 Upon his death in 2014, the football club renamed their oval The Alan Ray Oval - Ainslie, in recognition of Alan's many contributions. Don was Dux of Ainslie School in 1948. He graduated from the University of New England with First Class Honors and completed his PhD in Political Science at the ANU in 1964. Don held a number of significant posts during his career, retiring from the position of Vice-Chancellor of the University of Canberra in 2002. He remains involved in the Canberra community including as Chairman of the NRMA/ACT Road Safety Trust and Chairman of the Canberra International Music Festival. Dr Lenore Coltheart was Dux of the school in 1952. She taught political history in Australian universities for 25 years and held research fellowships at the Australian National University and at Newnham College at Cambridge University, before retiring to Canberra in 1997. Since then she has worked with the National Archives on a range of projects. Dr Coltheart's wide research interests are reflected in the range of her books and articles which include Australian political history, the history of ideas, Aboriginal history, maritime history, and landscape heritage. James Hird was School Captain in 1984. Although he tried his hand at several sports in his youth, including Rugby League and Soccer, James found his niche in Australian Rules Football, playing for the Ainslie Football Club. He was recruited to the Essendon Football Club in the 1990 draft and played his first game for them at 19 years of age. He completed a Civil Engineering degree in 1998. James stayed with the Essendon Football Club throughout his playing career, shared the Brownlow Medal with Michael Voss in 1996 and retired in 2007, having played 253 games. He was appointed coach of Essendon in September 2010. Dr Inkpen started at Ainslie School in1984. She is a Manager in the Legislation, Policy and Programs Branch of the Justice and Community Safety Directorate. Before convening conferences and managing the Restorative Justice Unit, she was a key researcher working with Dr Heather Strang and Professor Lawrence Sherman in the field of Restorative Justice, which is the subject of her PhD, for over 10 years. Dr Inkpen and her husband Hamish Robertson have three daughters who attend the school. She took on the role of President of the P&C in 2014. Ben was school captain in 1990. A talented musician, Ben decided to share his talent by becoming a music teacher. Ben was a music teacher at Campbell High School and had Ainslie School ex-students in his classes. He is currently a music teacher at Hawker College. Mr Michael David "Mick" Gentleman is an Australian politician and a member of the Australian Capital Territory Legislative Assembly representing the electorate of Brindabella for the Australian Labor Party. Mr Gentleman attended Reid Preschool and Ainslie School. Georgia Pike is the Convenor of the Music Engagement Program at the Australian National University (ANU) in Canberra, Australia. A singer, educator, community outreach facilitator and transdisciplinary researcher, Georgia spent a year in New York training in voice with Susan Burghardt Diamond and Claire Alexander (former voice coach to Frank Sinatra) and studied at the Institute of Music and Health with founder Dr John Diamond (2002). She completed a Bachelor of Arts majoring in Law and Classics at the ANU (2006), a Graduate Diploma in Secondary Education through Monash University (2009), and submitted her doctoral thesis in September 2016, also at the ANU. Her thesis developed a transdisciplinary framework encompassing history, ancient world studies, etymology, pedagogy, philosophy, and the origins of music in human society, for application to the everyday practice of music in classrooms and communities. Supported by the ACT Government, each year the Program trains over 250 teachers and engages thousands of children in music making and outreach through their free programs and events, designed in response to teacher and student feedback. Georgia attended Ainslie School and was taught music by Ainslie School's long-standing music teacher Julie Mayhew.